I tend to not get overly excited about new releases. The last few years have seen a lot of incremental upgrades that rarely blow me away. Usually, I end up thinking the new version of whatever is better than the last version. Not “rush out to the store and buy it” better, but “consider upgrading if you use it a lot” better. 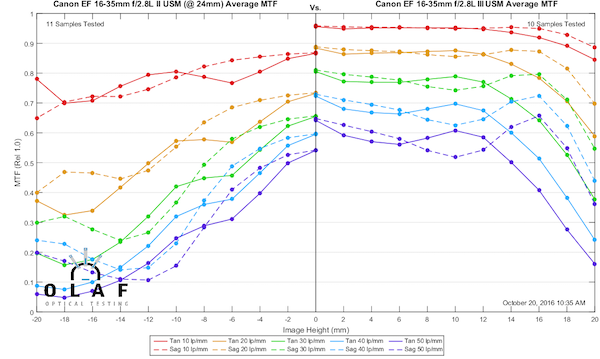 Canon, though, (and Sigma) have hit some real home runs with optics lately, so I was a bit excited when Canon decided to upgrade one of their weaker lenses, the 16-35mm f/2.8, to a Mark III version. And if you don’t want to read the article I’ll summarize: rush out to the store and buy it. As always, this isn’t a full review; that isn’t what I do. 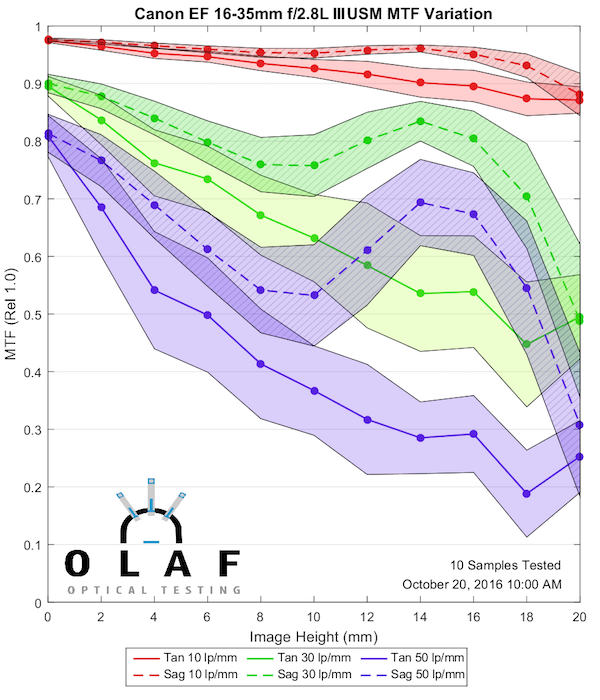 This is optical bench tests. Usually, I say stuff like ‘wait until the reviewers tell you how good it handles, and focuses and what the bokeh is like’ before you decide if it’s a good lens. Not this time. Optically this is such a big improvement that you just need to get it. If there are problems with that other stuff, then learn to deal with them. 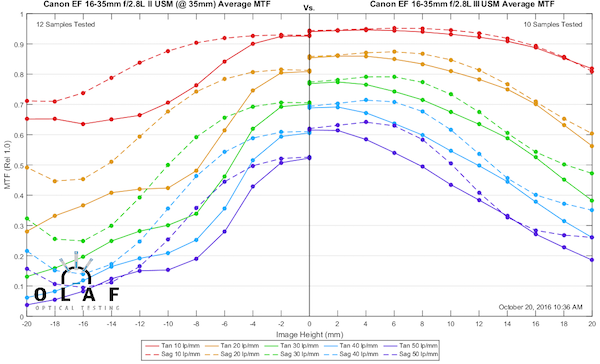 Markus has made me a shiny new software tool that makes it easy for me to compare MTF curves between one lens and another, so I’m going to play with that for this post. As always, if you don’t speak MTF higher is better; dotted and solid lines of the same color close together is better; and on the horizontal axis “0” is the center of the image and “20” is very close to the corner. The rest is details. The logical comparison, of course, is the Canon 16-35 f/2.8 L Mk II (left side) with the Canon 16-35mm f/2.8 L Mk III (right side). 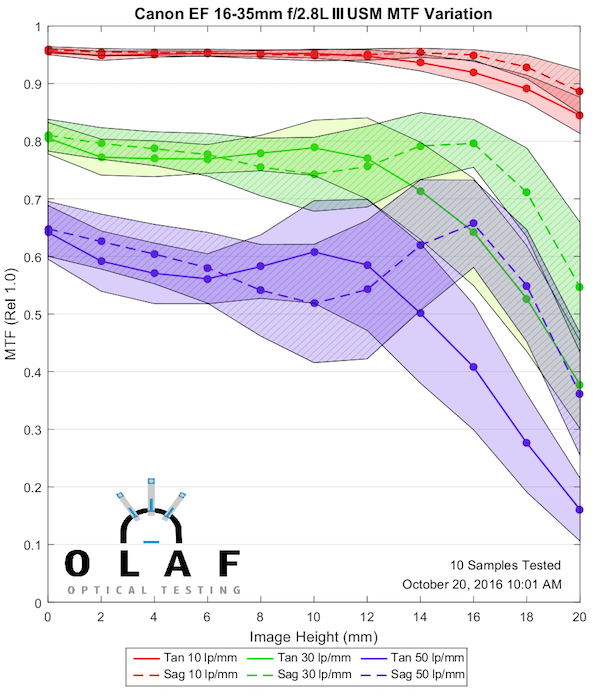 Here are the MTF charts for both lenses (the graph is the average of 10 lenses tested) at 16mm, 24mm, and 35mm. 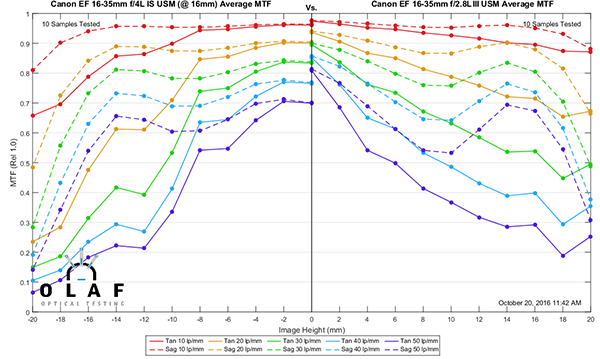 At all focal lengths, the Mk III is clearly better than the Mk II both in center and off-axis sharpness. It also has far less astigmatism at both ends of the zoom range. This isn’t close at all. It’s a dramatic, easy-to-tell-in-your-photograph difference. The mark III version is dramatically better. 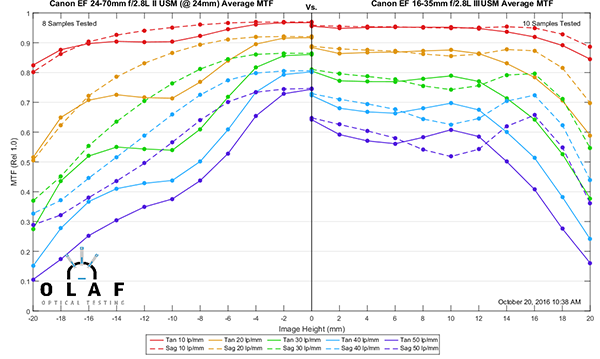 The Canon 16-35mm f/4 IS is a sharper lens at f/4 than the f/2.8 Mk II is at f/2.8. The mark III was so much better, though, that I thought it was worth making a direct comparison. 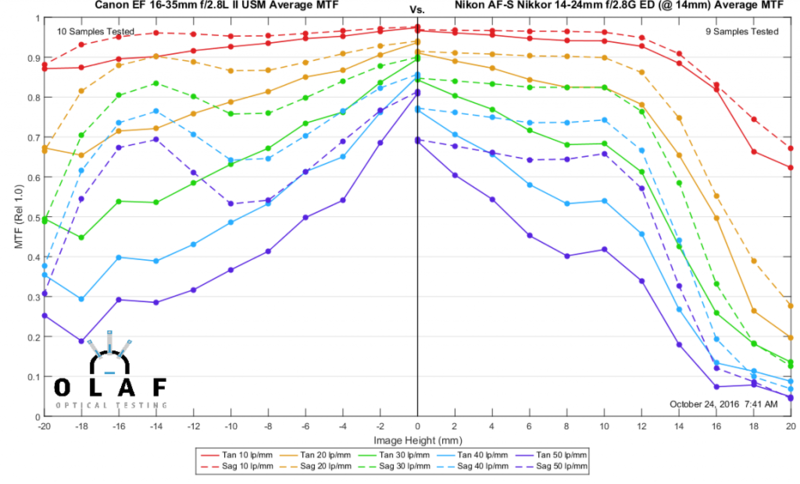 Giving up a stop of aperture is a huge disadvantage for MTF testing, but despite that, the 16-35mm f/2.8 Mk III is slightly better at f/2.8 than the 16-35mm f/4 IS is at f/4. There’s not a lot of difference, obviously, and I wouldn’t choose the f/2.8 Mk III purely on the basis of sharpness; the f/4 is less expensive and has IS. But if you need f/2.8, then there’s no sharpness penalty for going with the wider aperture lens. 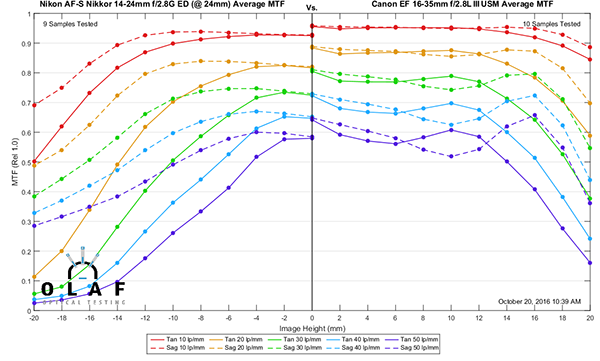 The 16-35mm has been considered the weakest of the modern Canon zooms for some time. If I had an option for another lens, I generally went with the other lens. This comparison is one that I was really interested in since I tended to use the 16-35mm as a 16-22mm really and changed to a 24-70mm zoom whenever I could. The Canon 24-70mm f/2.8 Mk II is about as good as we see in a standard range zoom so I didn’t expect the 16-35mm Mk III would be as good but thought it might be reasonably close. The 24-70mm is, indeed, a bit sharper in the center. As we go away from the center, though, the 16-35mm actually is better by the middle of the frame. It might well be the better landscape/architectural lens at 24mm. I’m pretty surprised by this. I hesitated to make this comparison, first because I know fanboys are going to start screaming online about it, and second because these aren’t really zooms of the same range. This is the middle of the Canon range but the extreme end of the Nikon. But for years now, the Nikon 14-24mm f/2.8 has been the gold standard of wide angle zooms and I was interested to see if Canon had finally caught up. They’ve done better than catch up. I can keep doing comparisons for pages, but the bottom line is clear. 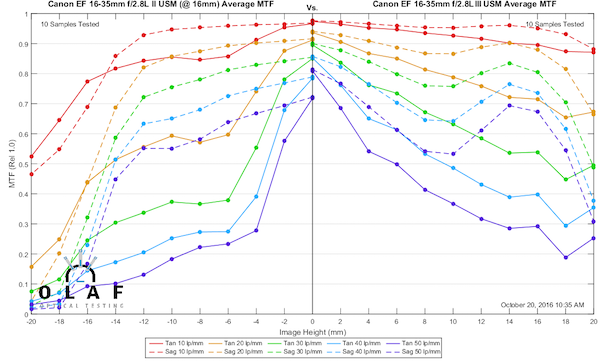 From an MTF standpoint, the Canon 16-35 f/2.8 Mk III is the best f/2.8 wide-angle zoom I’ve ever tested. The sample variation for wide-angle zooms is usually pretty significant, but the new 16-35mm f/2.8 Mk III keeps that under pretty good control. 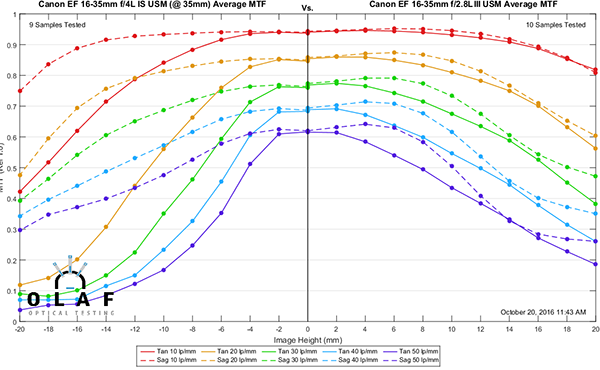 Below are the variation spreads at 3 focal lengths (most zooms have one focal length at which variation is highest). The copy-to-copy variation for this lens is quite reasonable, but if you see it in your copy you’ll probably notice it at 35mm. Still, it clearly has less variation than the 16-35mm Mk II. This summary is quick and simple. From a resolution standpoint, the Canon 16-35mm f/2.8 Mk III is the best f/2.8 wide-angle zoom available. You might be better served with the f/4 IS and some money in your pocket. There are also some very good wide-angle f/2.8 zooms available from third party manufacturers that are a lot less expensive and might offer more bang-for-the-buck. But if your style of photography needs the highest resolution you can get with a wide-angle lens, well this is it. I don’t use a wide-angle zoom all that often, but when I do, it will be this one. Addendum: A few Nikonians are upset because I only showed their favorite lens at 24mm, not 14mm where it is best (and they are correct, that is where it is best) I’ve posted the Canon at 16mm vs Nikon at 14mm comparison below. And because I know it’s coming next, I don’t have the Nikon measured at 16mm, but at 18mm, where I do have data, it is not as good as it is at 14mm. Hello. I am about to purchase my first FF camera, which I can’t decide on between A7r3 and 5Dm4, but I want to get a nice wide zoom for landscapes. Because my pockets aren’t that deep I was looking at the Canon 16-35mm F4 IS L and wanted your opinion on whether it is a good alternative to the newer 2.8 iii version? I doubt I will use it for anything except landscape/scenic photography so would that extra stop make a difference? Also is the 2.8 iii version a lot better overall than the F4? I checked on DXO and they didn’t give either lens great reviews compared to Sony. Unfortunately I don’t understand your graphs much but I reallly enjoy the blogs your company does as a whole. Thank you for any advice ? Thank you for the great article! Has anyone noticed a poor image quality when zoomed in 100%? I own 5D Mark III and recently bought a new Canon 16-35mm f 2.8 iii lens. Not sure what I am doing wrong, but I am not happy with overall quality when the image is 100% zoomed in. I tried multiple shots and compared to other L lenses I own. When I zoom in the image, it has a lot of noise. Is there a setting that needs to be changed as this is a new generation lens? I updated my camera firmware, but that didn’t affect the image quality. Anyone experienced this? Or is this normal? Any chance of comparing to the Tamron 15-30mm? – results show the f4lens @16mm (where I use it most) around f5.6-f8, is actually sharper in centre and close in the edges so I certainly wouldn’t upgrade for the 16mm end. I never use it wide open so wide open comparisons are less interesting. However at @24mm and 28mm the differences at f5.6 or f 8are a trade off between whether you prefer edges or centre (the f4 lens generally looks better in centre but worse edges) but really it’s too close to bother worrying about; and at 35mm the f2.8 looks better all round. That’s using the chart. I would like to see more IRL images to compare . I would love to upgrade to any lens that will give me a noticeable improvement on my camera (Canon 5dsR), however it seems that unless I know whether I have the best copy available of my lens then I might have improved simply by testing more versions of the same lens before buying. The suggestion someone made that you could make money offering ‘test-assured ‘ lenses may not be so unworkable as it seems at first. 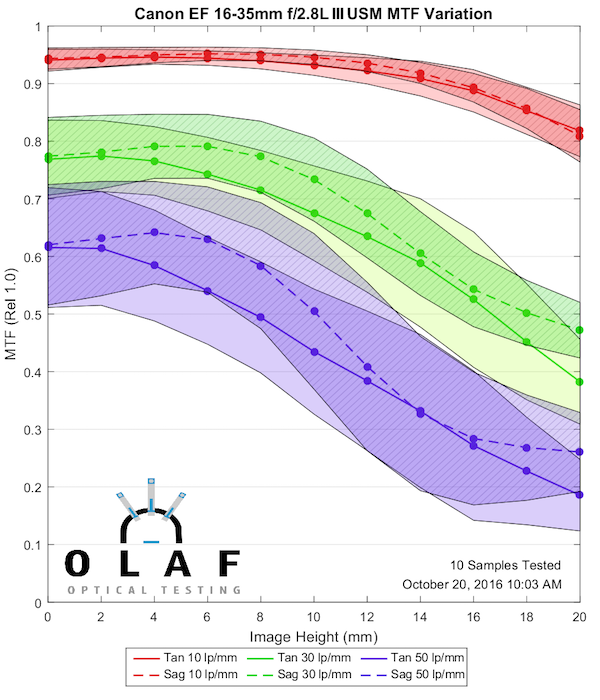 People pay a LOT for Leica lenses on the basis that the QC is superior, it would still be cheaper to buy a canon 16-35 lens with your testing fee on top tan fork out for Leica (or Zeiss) glass. I could well be tempted. The only reason I use zooms rather than prime lenses is because I hate dust bunnies and detest the palaver of removing them in post. I know you can map them but it’s still a palaver. I use one zoom when I go out, only changing lenses indoors in good conditions. Yes I probably an nuts, but it’s my gear and tat’s what I do with it. So If a zoom gets anywhere nearer primes Im all for it. In fact I think the 16mm end is at least as good if not better than the Canon 14mm, so forget whether it’s zoom-v-prime (though I loved your article on that), I will be using a zoom for UWA and will pay for the very best that’s available. A always knew you were a smart cookie, but your personal camera choices confirm it once more! I use a Pentax K-1 myself; it is such a joy to use and filled with useful features. One of the things about the f4 is it has really good IS, I was getting 5Dsr-sharp shots at 1/5th and 1/6th recently (somewhere I couldn’t use a tripod) which a f2.8 non-IS lens just isn’t doing. On Canon, with something like the 16-9 adaptor? Any chance of a comparison to the 11-24? As I have the 16-35 f4 and find the IS too useful indoors to get rid of it, but don’t really like the corner sharpness at the wide end, the 11-24 would seem a better way of improving that (rather than having two 16-35s). I have the 16-35 f4 and I’ll be keeping it (partly as the IS is so useful indoors) but I’ll really miss the difference in the corners at the wide end, so will lust after the III a little (luckily the price will help me get over that). First of all, it’s hyperbole. Second of all, for a normal shooter who hops in and out of his car, the weight difference is nothing. For a long distance, week- or weeks-long backpacker/photographer, where we count every ounce, this is a huge difference in weight. It all adds up, and in order to reduce weight, you do so by a few grams or an ounce, or more, on every piece of gear you own, as long as you keep the functionality (or sometimes, you even reduce functionality if your weight savings is significant). So yes, I’ve bought new $500 sleeping bags because they save me a few ounces. Again, by itself, it obviously won’t break your back. But if all your gear reduction can save you 10 pounds, when you’re hiking 15 miles a day and gaining 4000 ft of elevation and then losing 4000 ft of elevation on average, for a week or longer, that weight saving is truly important. Nikon’s design indifference is a significant reason I didn’t pursue the D500. It’s actually insulting how bad the 58/1.4 is relative to the asking price. It’s a $300 lens inexplicably sold for $1500. Given that it’s the only first-party choice for a crop portrait lens, it soured me on the whole system. I am a keen astro shooter. I have the 24L II and do complain about it’s vignette. The thing to remember though is that you can close it down by 2 stops and it’s still f/2.8. With the 16-35L III, if you close it down 2 stops then you’re at f/5.6 which is kinda weak sauce for astro. My lens of choice is the 35L II at f/2. Hoping there is another well corrected wider fast prime on the way like a bulbous 16 or 18mm f/2 or an ultra-fast 20 or 22mm f/1.4.